This is my last guest designer project for Maymay Made It, and I wanted to make a project from the heart. 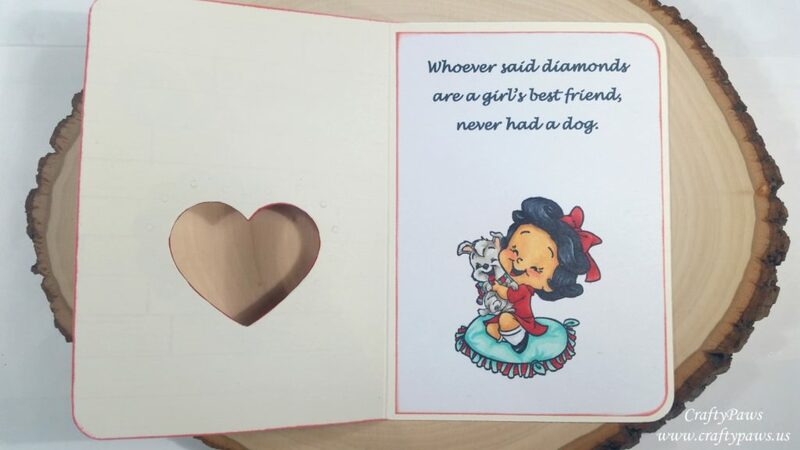 It's an inside-out peek-a-boo card, and I think it expresses my love of dogs perfectly. I started with a cream colored card base and created my own background with the Docrafts Wooden Boards Background Stamp. I wanted to try to match some rosy colored card stock so I used Simon Says Stamp Rose Apple Premium Ink. I then cut the card base down so that it would be 6" x 4.25" (this is slightly taller than a standard A2 size but I wanted plenty of room for my image and sentiment inside the card). I next worked on the inside of the card. 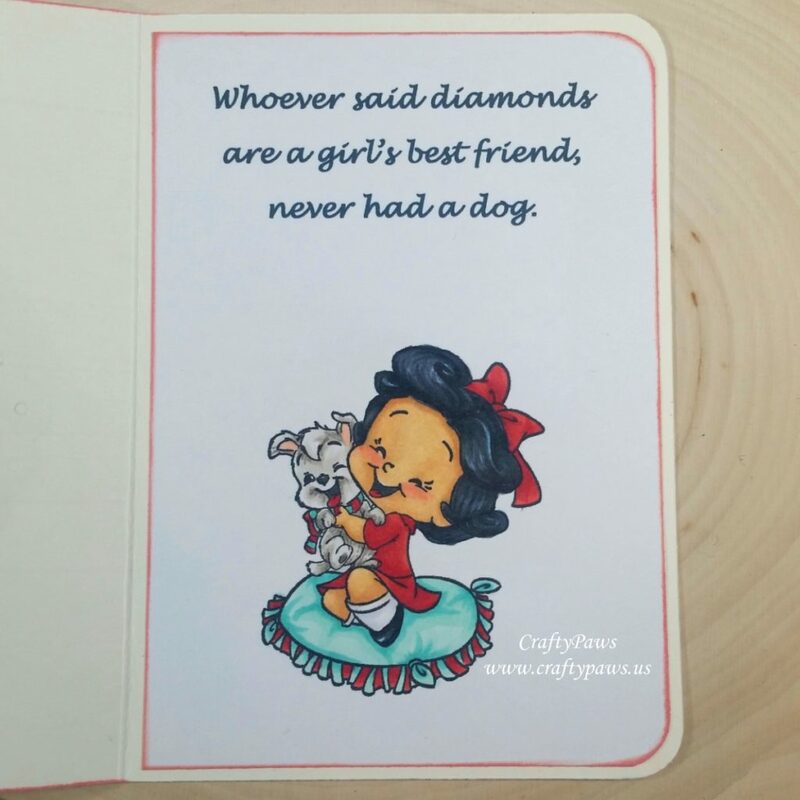 I printed from my computer the saying that inspired this card, "Whoever said diamonds are a girl's best friend, never had a dog." Then I used the MISTI and stamped in the lower 2/3 an adorable C.C. Designs image of a girl cuddling her puppy; it's called Birthday Puppy. I set this aside to Copic color later, but I needed it figure out the positioning of the heart window for the card front. I used the Darice Love Theme Embossing Essentials and embossed the card front with the scalloped heart frame die and a Sizzix silicone embossing mat, using the girl and the puppy stamp to approximate the positioning of the die on the card front (this is clearer in the video). I next used an X-Acto knife to cut out the center heart to create a window on the card front. To create a bit of dimension and add stability to the card front, I die cut the XOXO and the scalloped heart frame three times each and glued them stacked all together with Art Glitter Glue (the Fine Tip Nozzle makes this easy). 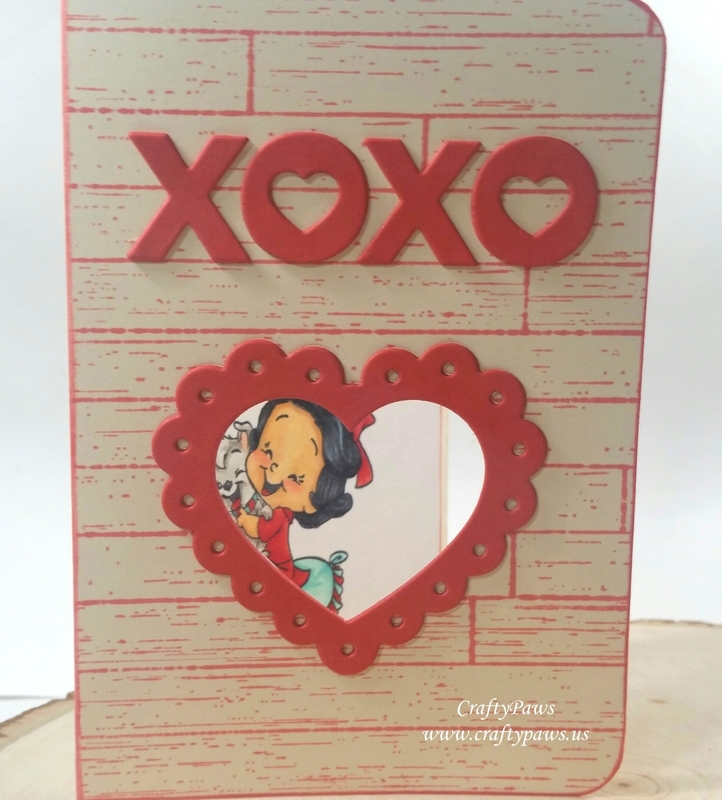 I positioned the XOXO in the upper third of the card front and the stacked scalloped heart frames around the heart window I had cut out by hand. To soften the card a bit, I rounded the two right corners with the 3/8" side of a We R Memory Keepers Crop-A-Dile Corner Chomper, and I did the same to the inside of the card liner piece too. I also inked the edges of the card front and the card liner with more Simon Says Stamp Rose Apple Ink to give a finished look.